Spotlight on Chicago artist Jeff Carlson! Jeff Carlson is a name that many Svengoolie fans, like myself, are familiar with. Not only had the 42 year old Chicago artist been a regular contributor to the former Svengoolie Web, but also the current Svengoolie YAHOO group page. You can often see Jeff’s work shown by Svengoolie himself during mail segments thanks to his regular submissions. Mr. Carlson has worked as a commercial illustrator for the past 24 years. Born and raised in Peoria, Jeff moved to Chicago ten years ago where he continued to ply his trade. 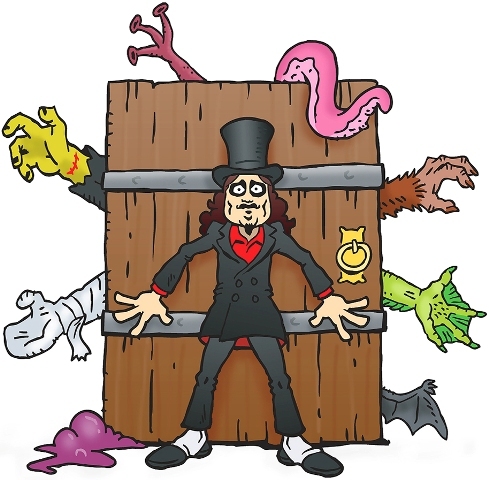 Aside from delighting Svengoolie fans with his work, he has also developed his own web-store – “Mani-Yak Monsters” (link featured to the right) that sells classic monster T-Shirts and novelty items! A true fan of the genre, Jeff’s creativity is matched only by his versatility. 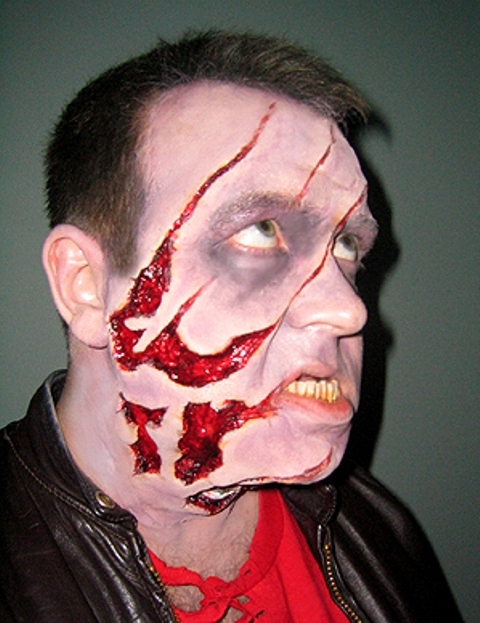 In addition to being an illustrator, he is also a talented make-up effects artist. Many Chicagoans get to experience his work first hand while visiting local “haunted” attractions during the Halloween season. Jeff’s incredible eye for detail has also assisted him in working with fine jewelry. This has placed him in an effective position of not only creating his own works of art, but detailed Hollywood props and replicas as well. Although I have known of Jeff for quite awhile, there was clearly much to learn about him. I was delighted when he agreed to take some time out of his busy schedule to do an interview for us. DAVE: Jeff, after seeing your work on the Svengoolie Web for the past several years, I am happy to finally have this opportunity to chat. Tell me a little about yourself and how you got started turning your love of vintage monsters into a business. JEFF: Well, the short version is that I had a Grandmother who loved old movies and she let me stay up late and watch “Creature Features” when sleeping over at her house. I’ve always drawn and played with clay . . . the two worlds were bound to collide. I also grew up a couple blocks from a drive-in theater, that probably didn’t hurt creatively either. DAVE : Clearly, you are a big fan of classic monster and vintage science fiction films. Which ones would you say are your favorites? 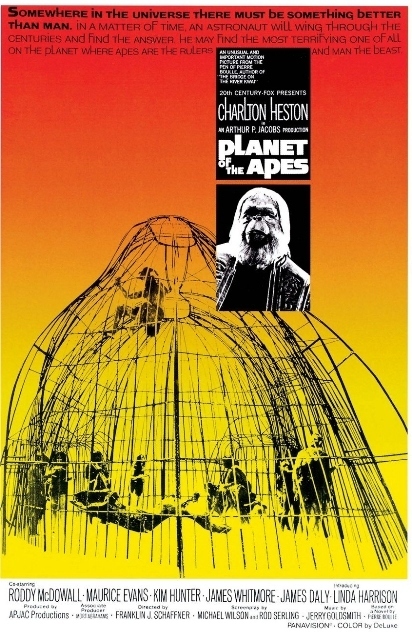 JEFF: It’s funny, I don’t really consider myself a Sci-Fi fan but when I think about key movies that have affected and inspired me over the years, the Chuck Heston trifecta of PlANET OF THE APES/OMEGA MAN/SOYLENT GREEN are the first things that come to mind. Honestly, the classic Universal horror monsters have provided me with the largest creative outlet as I’ve done tons of drawing and sculpts of those creatures over the years. DAVE: As a fellow Svengoolie fan, tell me your favorite memories of our local horror host and some of the work that you have done for him. JEFF: Ah, Svengoolie. He holds a special place in my heart because his show takes me back to a very specific place and time. When my family got cable (1981! ), Sven was doing his “Son of” schtick on WFLD Channel 32 . . . and the rest is history. When I moved to downtown Chicago about 10 years ago, I got actively involved with fan-based web sites and am now a regular contributor. You may occasionally see my work pop up on Svengoolie’s program as I submit stuff all the time. DAVE: Tell me about some of the other mediums you’ve worked with and some of your favorite pieces. DAVE: Fantastic! I understand you’ve also recently created a rather unique collectible from the classic movie DRACULA. 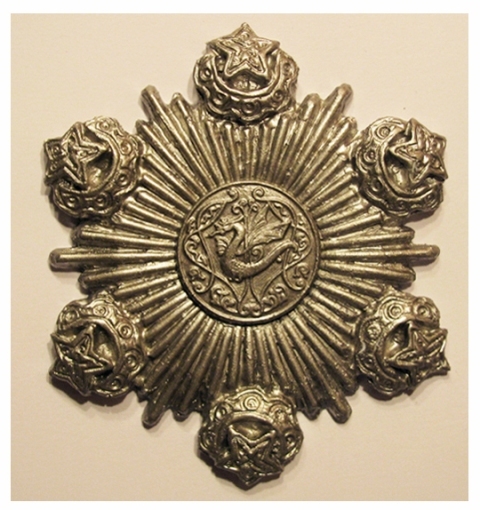 Costume shops often sell cheap versions of his iconic medallion, but none have come close to the original. DAVE: I can’t get over the details! 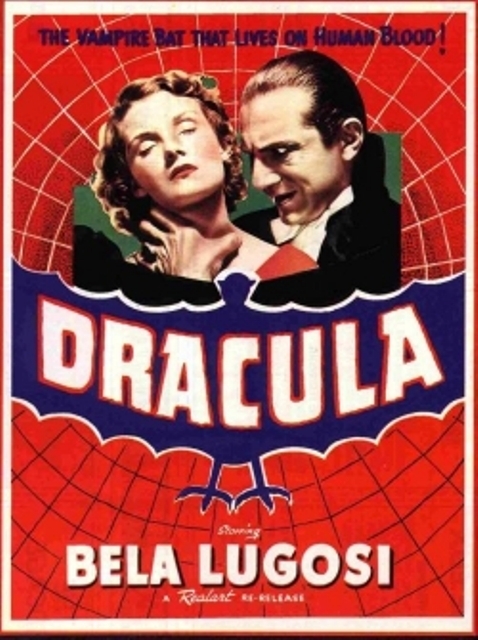 Tell me the significance of the medallion’s symbols, in regards to the character of Dracula. JEFF: Here’s a prop that even non-monster fans instantly recognize but scant historical info on it exists. 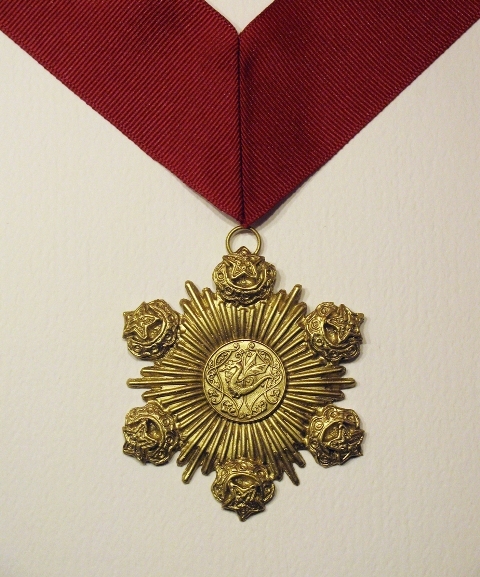 The original medallion has very little screen time in the classic 1931 film and it’s current whereabouts are unknown. With the advent of modern digital technology, it’s been a little easier to get detailed screen-grabs and photographic enlargements. Due to the somewhat vague and obscured details on the original prop, I’ve taken some creative liberty in order to produce a piece I’m happy with . . . I’ve incorporated a dragon motif in the circular center area with the intent of acknowledging the historic Vlad “Dracul” Tepes who partially inspired Bram Stoker’s fictional Count Dracula. My current run of these medallions are in a poly-resin but a Sterling silver edition is in the works. DAVE: There is only one other question I NEED to ask…..how can I get one!? 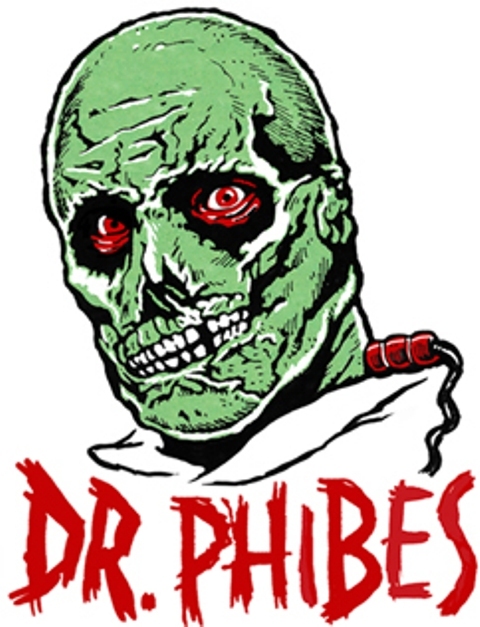 This entry was posted in Misc Mayhem and tagged Bela Lagosi, Chicago art, Dracula, Dracula's Medallion, Jeff Carlson, PLANET OF THE APES, Svengoolie, The Abominable Dr. Phibes. Bookmark the permalink. ← Wet & Wild: Roger Corman’s HUMANOIDS FROM THE DEEP!